After a long journey, the Nine of Cups symbolizes the finding of self-satisfaction. The emotional journey of the cups is starting to come to a close after the volatile ups and downs you faced in the earlier numbers of this suit. You have struggled to find purpose and joy after loss, you have tasted the different things that life offers, and you have left comfort in order to find greater heights. Here, you have found them, and you are indulging yourself as you celebrate this new stage of your life. When we look at the Nine of Cups, it can initially seem like one of the most pleasant cards that may appear during a reading. This is also referred as the wish card, which means that the things that you desire for, or your most perfect dream is bound to happen. 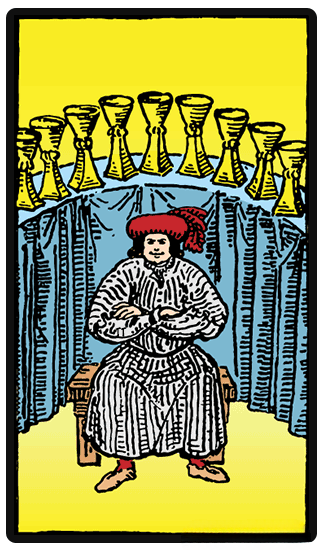 The Nine of Cups is normally associated with extreme happiness and satisfaction. The Nine of Cups is normally associated with extreme happiness and satisfaction. With regards to your work, there is a good change that something wonderful will happen in your workplace. It is time for you to push on your stalled project or if you have a something that you desire greatly, there is a possibility that you will finally achieve it. It also holds a positive meaning when it comes to love. Your romantic relationship with someone is destined to reach a new level. In case you are still single, this is the time to socialize with new people. In terms of finances, the Nine of Cups is also a positive messenger. It can mean that the financial state that you are hoping for will soon be achieved. In your health, the test that you have to undergo will lead to positive result. The good energy that you are receiving at the moment should be used to improve your health habits. When the Nine of Cups is reversed, you need to think more carefully about the things that you really want in your life. The Nine of Cups reversed can signify that you are looking for a more authentic feeling of fulfillment. Your path has been a hard one, and you've arrived at a period where you may have the appearance of fulfillment, but something else is missing. This may outwardly appear as smugness, and can indicate your desire to receive attention and recognition for all that you have achieved. But you personally still feel dissatisfaction in yourself - it seems as though your desires are never-ending, a black hole. Where does this stem from? In what parts of yourself are you lacking confidence? The Nine of Cups reversal denotes that it is time for you to stop placing a value on all your blessings, and instead pay attention to the quality of your life. The true treasures lie in your relationships with your family, friends, and community.